For tens of thousands of years, human beings have sought to codify the natural world and cosmos into patterns and figures. Numerous cultures throughout history have adorned themselves with jewelry of talismanic meaning— including the tribal Celts of prehistoric Europe. Even in modern times, Celtic wedding rings continue to carry meaning both culturally and symbolically. If you are looking for a Celtic wedding ring, this article will provide you with essential information for making your purchase. Since many people are attracted to the Celtic wedding ring design and style, and are interested in the “meaning” of the ring, we’ll start by showing you how to interpret knot-work patterns and motifs. You’ll also learn insider information on purchasing Celtic wedding bands that many jewelers would never tell you— from the advantages of a 14K gold ring over the more expensive 18K gold ring, to issues around ethical sourcing. Have you ever wanted to know how to interpret the meaning of the intricate knotwork designs found in Celtic rings? Though the Celts did not leave written records, we can come to an understanding of the knotwork in Celtic wedding rings by studying the ways their motifs are depicted in nature. To gain this insight, we’ll consider how to interpret six different knots commonly found in Celtic knot wedding rings: the cross, lemniscates, circle, triangle, wave, and spiral. This Celtic wedding ring simultaneously expresses harmony, simplicity and infinity . With just a single braid running down its center, our Rope Ring (shown above) is deceptively simple. You might not suspect the layers of complexity that underlie this design. All Celtic design rings start with one line crossing over another. Each line represents its own individual path. When the two individual lines cross paths, they now have a relationship to each other. One plus one equals two people married… there are an infinite number of new and creative choices. The crossing of these two lines’ individual paths gives birth to a coherent pattern— the braided design is the reward for their alliance. On a superficial level, this ring represents harmony and balance between two people weaving their life together. However, there are even deeper levels of meaning hidden here. A lemniscate motif is common in Celtic or Irish rings. Basically, the design is a horizontally-oriented figure eight— think infinity symbol. Jacob Bernoulli first formally described the lemniscate in 1694, although it can be found as a basic shape in Buddhist and Hindu iconography predating the seventeenth century. The lemniscate is also found in nature— such as in the shape of a whale or in the patterns of a river or ocean. In essence, two circles converse and crisscross at a common center point. In Celtic designs, the lemniscate implies the joining of two halves at a common point of focus, or even the touching of two equal circles reflecting against each other. This symbol in itself has come to represent infinity. Thus, the first illustration depicts a harmonious connection through infinite time. But there is even a third element to it: two circles are connecting. All wedding rings have the circle as a foundational element— our fingers are circular! If you consider where else the circle is found— such as in the planets, the sun, the cycles of existence, our cells, plants, bones and eyes— you will begin to understand how the circle is the blueprint behind life itself. But what is the circle actually doing? Circles represent relationships based upon wholeness and inclusiveness. They symbolize completion, community and the unifying order of cycles that repeat over time. The circular motif often found on the surface of Irish wedding bands, even our simple rope design shown above, allows for design patterns that flow dynamically. Consider also that change within a committed permanence is a wonderful symbol for marriage. In analyzing our Rope Ring’s simple braided design we can apply our understanding of the cross, lemniscate, and circle to our understanding of its symbology. This design is about riding with the flow, the wave. But how do you interpret what’s in the wave? Remember trigonometry? How about physics? Arcs (or arches) and waves are related mathematically to the circle, or parts of a circle. Waves of sound, light and water are filled with energy. They symbolize life itself, the ebb and flow of the cosmos, the force that drives all creation. Waveforms and arcs implicitly imply water and its symbolic associations— the tides, birth, the dream world, fertility, feminine energy/Goddesses, and life itself. Waves and arcs are recurrent symbols of motion in Celtic culture. A natural, progressive motion might be referred to as ‘flow’— it is from this that we derived the name for our Flow Wedding Ring. When you look closely, you’ll see an oval— a variation on the circle. Like all circles, ovals hint at creation— consider the shape of an egg or the orbit of a planet. Another common motif in Irish Celtic Ring designs is the spiral. In nature, the spiral can be found in clouds, sea shells, the eddies of a river, or even star formations. A universal symbol, spirals are found in iconography across myriad cultures. The coiling shape of the spiral suggests an ordered evolution starting from a center point and unfolding dynamically. Our Two Tone Rolling Moon Wedding Ring is an excellent example of this design. The spiral is all about expansion and contraction, focal points that explode outward and then collapse back on themselves. This cyclical motion drives our universe forward— not unlike the cycles of our phasing moon. The Celtic Arches Wedding Ring is a complex design containing triangles and arcs. The triangle is another important shape in our natural world. Consider where in nature you see a triangular shape: the tip of a leaf, or the shape of a predator’s face, beak, or claws. Triangles indicate intention and direction toward a goal. Unlike the arc, wave, or spiral, the triangle is not suggestive of flow, but rather of linear movement. The Celts would have employed triangles to communicate a focus of energy toward some intended goal. Here’s a challenge for you: Before reading our explication of the Celtic Arches Wedding Ring (shown above), how do you interpret its design? This ring contains triangles, arches and waves— what do each of these mean to you? Write down your response. This ring shows two interwoven lives, definite and creative. The strands of the knot arch up to the heavens, and then down to the Earth— gathering energy and inspiration from both. The individual lines’ broad, sweeping motions are reminiscent of ocean waves. They crest just before meeting, then gather from above and below to commence the cycle anew. There is an innocent joy in this process, as we learn to surrender to the mystery of life. 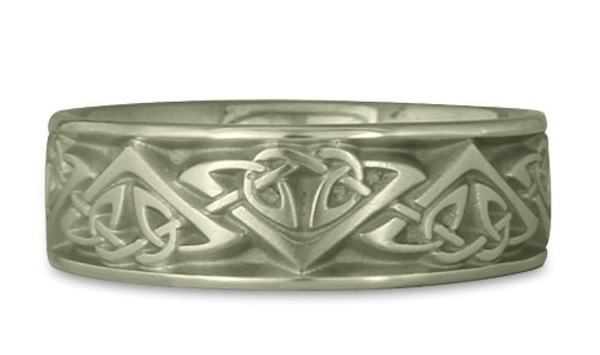 One final word on your journey to interpret Celtic Knot rings for men or women. We recommend that you choose your wedding ring by simply feeling for a natural attraction. Let the ring choose you, if you will. Then spend some time looking at its design elements, using this basic guide as a starting point.You might gain insight into your relationship with your beloved partner just by observing and understanding what you are both attracted to. Once you've decided on a knot work design, it's time to choose which metal will best suit you and your partner’s wedding bands. For gold Celtic wedding rings, you have three main choices: yellow, the natural color of gold; rose gold, which is yellow gold turned rose mainly because of copper alloy; and white, which is yellow gold made white using nickel and silver. You can also choose among natural white precious metals for your ring. Both platinum and palladium wedding rings, are fine choices for your ring, are 95% pure white metal. The remaining 5% is alloy, used to harden the metal and make it more suitable for jewelry production. Also, though not as common, silver wedding rings are .925% fine pure silver, and are very affordable. You can also combine metals and create two tone wedding rings, which is perhaps the best option for reasons we’ll cover a bit later. In this section, we’ll start with the basics, considering gold as an option for you and your partner's wedding rings. From there, we’ll look at alternative white metal options. Have you ever wondered where the term "karat" comes from? “Karat” is actually a variation of the word “caret”— a word traceable to ancient Greece, where carob seeds were used as units of measurements. “Carat” is now used as a unit of weight for gemstones, while “karat” is the percentage of gold in a wedding ring. Pure gold (.999 pure) is considered twenty-four karat or 24K. A 14K gold band would be 58.5% gold, as derived from the 14/24 ratio. 18K wedding rings are 75% gold. You may be familiar with this basic information on gold Celtic knot rings— but a clear understanding can prove especially helpful. Jewelers will almost always recommend an 18K gold wedding ring over a 14K gold ring. An 18K wedding ring contains more gold— making it more expensive to you and more profitable to a jeweler. When it comes to white gold wedding rings, 14K is actually a better option than 18K. The reverse it true for yellow gold rings. Rose gold, on the other hand, comes down to personal preference. We’ll explain why below. 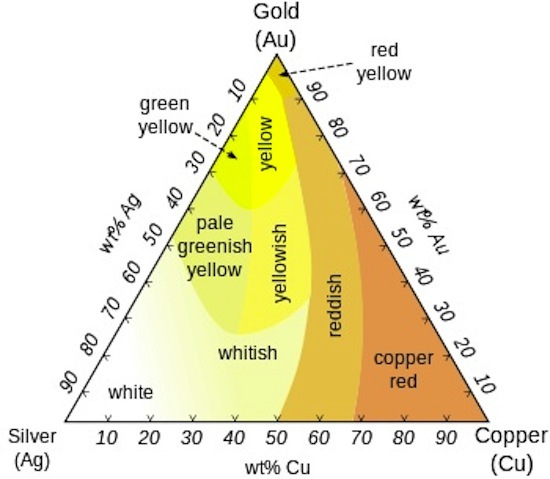 The chart above shows some of the various alloys mixed with gold to create white and rose gold. Whether you choose 14K or 18K gold for your Celtic wedding ring will depend both on your budget and on your color choice. 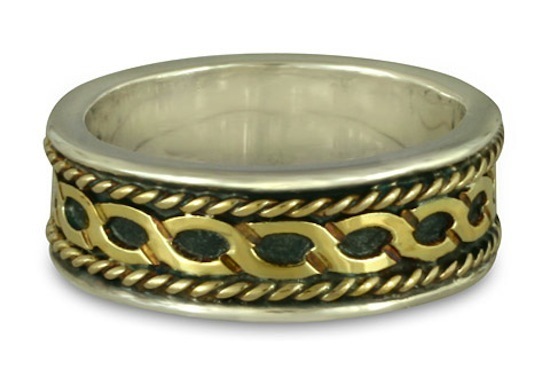 If yellow gold is your preference, we recommend a Celtic wedding ring made of 18K yellow gold. Gold’s naturally illustrious beauty and warmth are perfectly showcased in this high—karat form. The cost will be higher than a ring of 14K gold— but we feel it’s worth the investment, considering you’ll be wearing your ring for an entire lifetime. If you’d like your wedding band made of rose gold, the choice of 18K vs. 14K comes down to a matter of preference. Copper is the primary alloy used to turn yellow gold into rose gold. 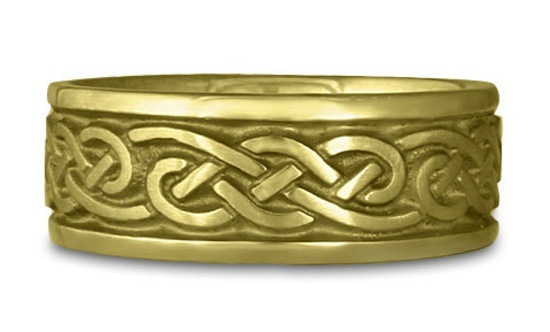 If you want a yellow-rose tone in your Celtic wedding ring, go with the 18K. 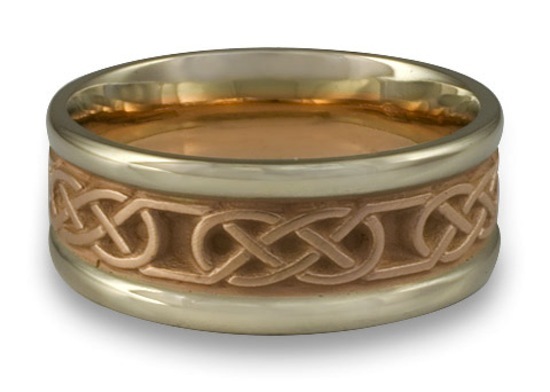 Choose a 14K rose gold Celtic wedding ring if you want a more copper-rose color. It will be less expensive, more “rosey” in color, and more durable due to the increased percentage of copper. For white gold Celtic wedding bands, we recommend 14K gold. 14K white gold wedding rings have a greater alloy content, which translates into a whiter color. 14k white gold wedding rings are both less expensive and stronger than 18k rings, as shown in the chart below. But how does white gold compare to silver, platinum, or palladium in a wedding ring? 11. How White Does Your Celtic Wedding Ring Need To Be? We’ll be able to best answer this question by considering the issue of “whiteness” in Celtic wedding rings. Getag Munsel’s color spectrophotometer graph, shown above, depicts the degree of yellowness in white metals. The whitest metals are naturally white. Though not shown here, silver is slightly whiter than platinum. Palladium, which in recent years has become a particularly popular choice, is comparable to platinum in color. We do not recommend rhodium plating due to the maintenance involved. Over time, the rhodium layer will wear off— and your ring will need to be re-plated. We feel a wedding ring should be enduring, and should not invite more hassle into your life. As jewelers, we sell more white gold Celtic wedding bands than yellow gold wedding bands. White gold remains the most popular choice for our customers— it is both affordable and traditional. Platinum wedding rings are probably the first choice for most people. Unfortunately, they are also the most expensive. Palladium rings, however, are a great alternative— and they’ve seen a dramatic increase in popularity over the past two decades. Palladium is close to the same color, and in the same price range, as 14K white gold. Palladium is considerably lighter (or less dense) than platinum— although once it’s on your finger you won’t notice the difference. Silver is also a popular choice. It is the least expensive of any of the precious metals, and is particularly suitable for two-tone wedding rings, as I’ll discuss in the point to follow. For greater detail on the subject of white metal wedding rings, read my companion article—> White Metal Wedding Rings: 11 Points To Know Before Your Purchase. Rose and white gold juxtapoze the knot and borders divinely. Before moving on to Celtic wedding ring styles, we should consider two-tone wedding rings. Using one metal for your ring’s knot design and another for your ring’s base creates a contrast that allows the pattern to “pop.” Any of the metals mentioned in this article can be combined in your custom Celtic ring. You can have a white gold knot and a yellow gold base, or a yellow gold knot and silver base. Two-color gold wedding rings are particularly beautiful. 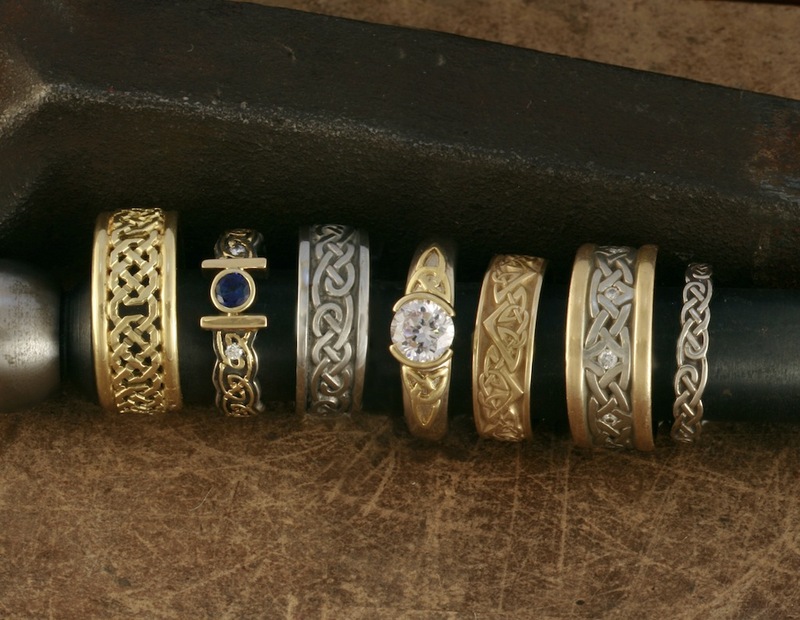 Over the years, we’ve sold countless silver-and-gold Celtic wedding bands. We make them entirely by hand, starting with flat sheet metal and forming it into rings. They hold up very well and look exceptionally beautiful, as the silver can be oxidized to create a great antique look. 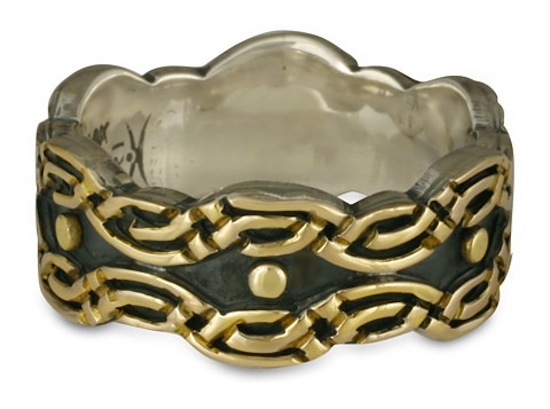 They are also less expensive than two-tone gold-over-gold Celtic wedding bands. 14. 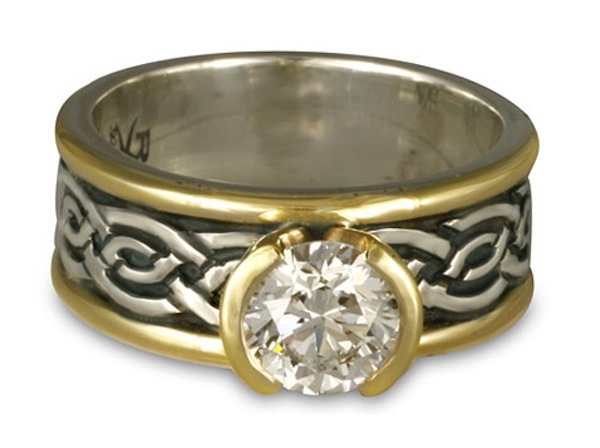 How Durable Is The Precious Metal In Your Celtic Wedding Ring? Alloy has two functions in wedding rings: it both colors the metal and hardens it— making it more suitable for jewelry production and creation. To illustrate, fine gold has a hardness level of 2.5 out of 10. That’s about the hardness of your fingernail— far too soft for wedding rings, which we anticipate wearing every day and expect to hold their shape. Once alloyed, 18K yellow gold and sterling silver are about the same level of hardness. Natural white metals, as well as the more alloyed 14K gold, are stronger and more durable. If you are a rock climber or someone who engages in similarly-abrasive activities with your hands, you might consider more closely the durability of the metal of your wedding rings. If you don't anticipate being so hard on your ring, any of the metal choices described in this article will hold up fine over the years. 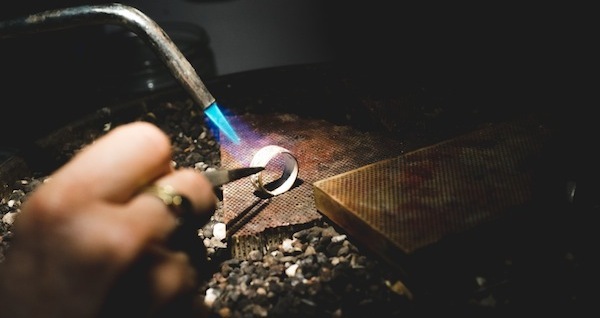 This is our Lead Designer creating a beautiful handmade wedding ring out of silver and gold. 15. Fabrication of Celtic Wedding Rings: Who Are The Makers? If you would like your Celtic wedding rings to be the perfect talismanic expression of the uniqueness of you and your partner, precisely how your rings are made will be important to consider as well. Wedding rings can be made in large commercial plants where they are mass-produced using CADCAM or die-striking methods. In the former case, the ring is rendered on a CADCAM program, forwarded to a modeling machine, and reproduced in a repetitive casting process. Die struck rings are made when one piece of steel “strikes” another piece with fifty tons of pressure, shaping a previously flat piece of metal into a wedding ring. Alternatively, you can choose to find a jeweler who understands the mystery and beauty of Celtic designs, styles, motifs and symbolism. Metal welded by an artisan who has dedicated their lifetime to achieve a high level of mastery is a rare kind of alchemy. The enduring relationship between the artist and his or her craft is reflected in a Celtic wedding ring that is handmade, which becomes an object of great beauty worthy of its talismanic meaning. Such handmade wedding rings need not be expensive, either— especially if the ring is made of silver and gold. For example, our two-tone Celtic wedding band, the Laura— which is entirely handmade in our studio— sells for just $495. 16. 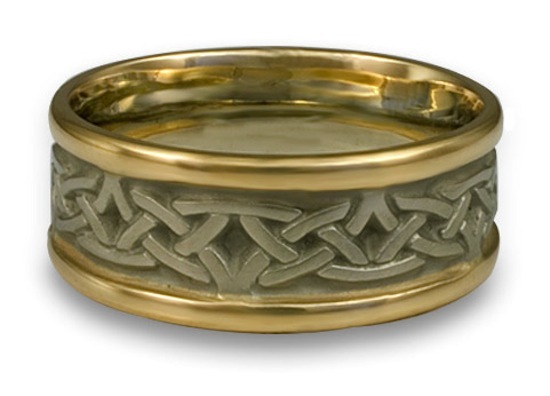 Ethics Of Your Celtic Wedding Ring: Where Does The Metal Come From? The Celts were tribal people who were deeply concerned about living in a respectful balance with their environment. If you come from a Celtic lineage, would you want your Celtic wedding ring made with “dirty gold” that has destroyed the environment and/or funded conflict? The unfortunate truth is this: unless you know where your gold is coming from, you are probably unknowingly contributing to the terrible impact mining has around the world. These days, one of the most common options for ethical metals is the “eco-friendly” recycled option. However, recycled metals do not actually prevent the ongoing destructive impact of mining to our environment. They do not prevent child labor, or the heavy use of mercury— which contaminates entire watersheds. In fact, the use of recycled metals avoids these issues by turning the supply house into the source of the metal. But no matter how much recycled metal is being used, mining will not stop. Gold (and other precious metals) are far too valuable. Here’s the deal: There are two very different kinds of mining operations. Large-scale gold mining is about the politics of greed and destruction: we have plenty of gold in the world, and we don’t need any more large mines. Small-scale mining however, is about the politics of bread: these miners work in the mines in order to survive and feed their families. a Fairtrade gold mining operation. There are approximately 15 million small-scale gold miners around the world and they supply about 15% of the world’s gold supply. Yet they are about 90% of the world’s gold mining labor. Their lives are characterized by extreme poverty and exploitation. Fortunately, we can help them by making your Celtic wedding ring out of Fairtrade gold. Fairtrade gold allows these miners to work their way to a better life. It’s backed by standards and principals set by Fairtrade International. If you’re still not sure about whether recycled gold versus Fairtrade gold is better, read this companion article which goes into more detail on the subject: 15 Reasons Why You Should Buy Fair Trade Gold Jewelry Over Recycled Jewelry. When you choose to make your Celtic wedding ring from Fairtrade gold, you can be assured that the miners were paid fairly for their work, and that the mining itself was done in a manner that was respectful and honorable to the environment. If you are really concerned about owning wedding rings that in their sourcing and fabrication reflects respect for our future and the earth, there is really only one choice: find an expert artisan who will make your rings by hand using Fairtrade gold.